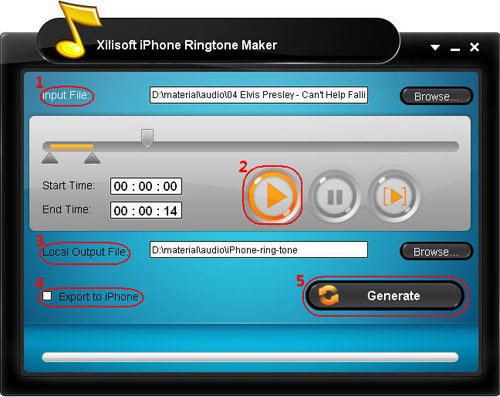 How to make your own free iPhone ringtone from any audio, video file? Any nonprotected audio file can be turned into a ringtone to use on your iphone for free. You don't need to pay $2 to have your every ringtone. Here is how to create your own free ringtones for your apple phone. New updates and fixes included. Although you can buy ringtones from iTunes, you can also make ringtones for your iphone for free. This tutorial will show you how to convert any unprotected audio file (wav, mp3, etc) into a ringtone. Get access to the mp3 or wav file that you want to convert to a ringtone. In my example, I am looking for a rock drummer loop as a ringtone for my friend who is a monkey percussionist. Step 5: Click "Browse..." button to choose a destination folder. You can also prefer to export the ringtone into iPhone directly by checking "Export to iPhone" button. Step 6: Start to make ringtone for your iPhone now.